Open-Face Grilled Cheese Sandwich . . .
Good bread, ham, and cheese are all this simple sandwich needs—but slices of tomato or pear may be added to create a more delicious effect. 1. Preheat oven to 450º. Spread one side of each slice of bread with softened butter. Lay ham slices on each piece of bread. Lay tomato or pear slices on top of ham, if you like. 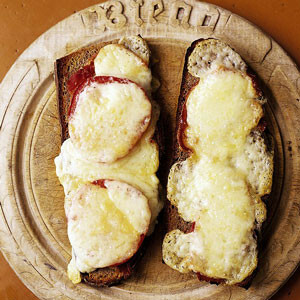 Cover tomato or pear (if using) and ham with thick slices of cheese. 2. Place sandwiches on a sheet pan and bake until cheese is melted and golden around edges, 6–8 minutes.